FOUR PAWS aims to resume the rescue mission once the situation has improved. 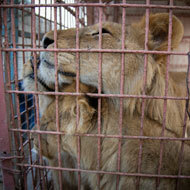 Plans to evacuate 40 animals from Gaza's most notorious zoo have been postponed due to ongoing unrest. Veterinary charity FOUR PAWS had planned to rescue the animals from Rafah Zoo in March and transfer them to sanctuaries in Jordan and South Africa. But owing to violent escalations on the Gaza strip, the borders have been closed, preventing the team from entering the country. The charity aims to resume the rescue mission once the situation has improved. Until then, locals inside the Gaza borders are lending their support by feeding the animals. FOUR PAWS veterinary surgeon and head of mission Dr Amir Khalil said: “Due to the closed borders, it was impossible for our team to enter Gaza. However, we are keeping an eye on the situation and the rescue will take place once the security situation has stabilised. “We remain on standby and are ready to go through with the rescue at any time. No matter how long we have to wait, we will not give up on the animals of Rafah Zoo”. Rafah Zoo attracted worldwide attention in January when it emerged that four lion cubs had frozen to death due to harsh weather and poor keeping conditions. A few weeks later a lioness was brutally declawed with a set of garden shears. The zoo opened on the Egyptian border in 1999 and, from there, wild animals are repeatedly smuggled through underground tunnels to and from Gaza. Since the zoo opened, many of the animals have died in rocket attacks and war battles. At the time of writing, a petition calling for the zoo’s closure had reached more than 153,000 signatures.